As you probably know by now, big changes are on the horizon for iWriter and I am looking forward to sharing some of those exciting details with you in the days and weeks ahead. For now, I can tell you that we are making a huge push to bring in many more top-level content writers and give you additional ways to make your site rank quickly. You’ll definitely want to keep an eye on your inbox. For now though, I wanted to give you some exclusive insights on the world of internet marketing and tell a little bit of my own story of how I got to where I am today. Just like many online entrepreneurs, I started my journey by selling things on eBay and eventually working up to selling my own products. First it was eBooks and then simple apps to better monitor a website’s relationships around the web. 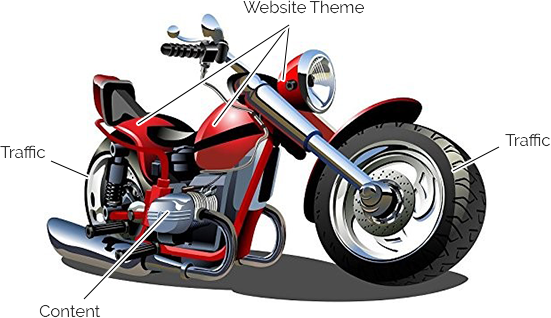 If your website was a motorcycle, then all of the shiny chrome and the glossy paint would be your website’s theme. It’s what catches your reader’s eye when they first visit, so it’s definitely important. But that’s not what ultimately gets you sales. The wheels are the ways that customers find you; whether it’s through a backlink, an email, a pay per click ad, social media, the search engines or even directly. It is also a critical component of any good website because without it, nobody would ever come across your domain in the first place. The most important part of the motorcycle by a very wide margin is the actual engine- and that’s your actual content. Because if you think of it from a buyer’s perspective, finding a link to a shiny new website doesn’t mean a thing if you can’t find answers that you’re looking for. That’s why people have said for decades that “Content is King”…you can’t have a successful website without it. Just think how many times per week you click on a link and then backspace out of it a few seconds later; that happens because the content just didn’t impress you. If your site has a high bounce rate, Improve your sites content. If visitors aren’t opting in for emails, Improve your sites content. If you sales are steadily decreasing, Improve your sites content. If the search engines are ignoring you, Improve your sites content. If you see a lot of returns on products, Improve your sites content. If people are leaving on sales pages, Improve your sites content. If PPC ads are not converting well, Improve your sites content. If you want more natural traffic, Improve your sites content. When I created my first website over a decade ago to promote a dieting book, I literally spent all day, every day building backlinks to generate more traffic. And it worked! I was topping over 20,000 visitors a day at one point, all while working a full time job (sort of…I’ll tell you more about that a little later). But at the same time, my conversion rates were horrible because I broke the Golden Rule- I didn’t focus on providing world-class content on every page. Now, don’t get me wrong. With that level of traffic I was still making very good money basically as a novice, and I spent every second of my free time figuring out ways to do even better. There was only one answer- I had to be more engaging to my visitors and give them a reason to stick around. Great content is the only way for that to happen. So know this. Over the next couple of weeks I am going to teach you absolutely everything I know about content marketing from A to Z. This is a 100% free course and I’m designing it to be as simple as possible so anyone can follow it. And if you’ll take the time to absorb this knowledge and really apply it to your current domains, then I guarantee you that your traffic will skyrocket and your bounce rates will virtually disappear. More importantly, you can also expect for your sales to go through the roof in time. Well, that’s simple. 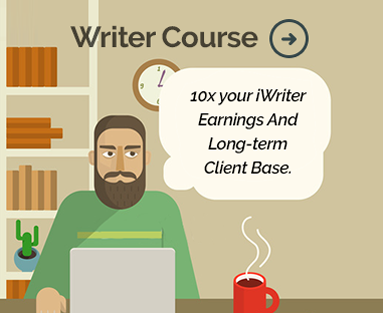 Once you learn to properly monetize your websites through amazing content, you’re going to turn to iWriter a lot more often to hire talent. That makes it a win/win for everyone involved. I definitely like being in the win/win business. This is great information. I will build it. A great informative article, Thanks for sharing.